This software aims to allow you to manage all the alcohols in your cellar (Wines, spirits, beers, etc...). 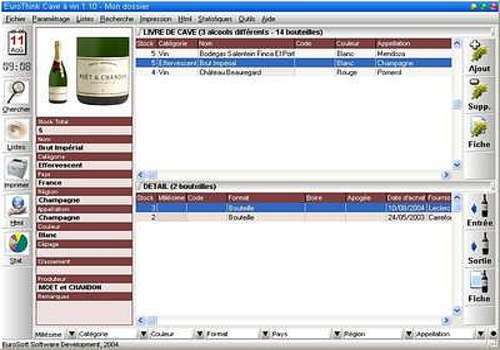 Extract of the functionalities: Multi-folders; Complete management of your alcohols with detailed stock details for each batch of bottles purchased; Stock alarm management (viewing and printing of the list of bottles to be purchased); Cellar entries and exits with history; Tree view of the location of bottles in the cellar; 3 very powerful search modes: fast, multi-criteria and requester; Statistics generator for distribution by category, format, vintage, producer, etc....; Printing of detailed alcohol sheets and the list of the cellar; Viewing in Html format of detailed alcohol sheets and the list of the cellar; Backup and restoration function of the integrated database; Import and export function of the cellar in text format (for Access, Excel, etc.). This easy-to-use software is the essential tool for wine lovers and experienced oenologists alike. It allows you to manage all your alcohols (red, white, champagne, digestives...), French or foreign. Whether you are a simple amateur or a true enthusiast, wine is an art for everyone. At the click of a button, you will control every aspect of your cellar... so that a passion remains a pleasure. Bacchantis allows you to manage your wine cellar and tastings in a simple and user-friendly way. The most intuitive and easy-to-use cellar management software! Manage your cellar by integrating all your French or foreign wines. Thanks to many criteria, you can see the contents of your cellar at a glance. From the "Regions" command, you enter the names of the wine-growing regions or countries (The pre-entered elements can be modified).